Gazprom Neft has confirmed the digital transformation of its business as a priority area of focus, with the creation of a new “Digital Transformation Directorate”, to be headed by Andrei Belevtsev as Chief Digital Officer. The key objective of the Digital Transformation Directorate will be to create a single and inclusive system covering the company’s full digital strategy, directed at game-changing improvements to the operational efficiency of all business processes, as well as the development of the company’s own “smart services”. Commencing work in April 2018, the structural unit has now set about creating a long-term digital strategy for the company, to include plans for implementing new technologies, transforming organisational processes, and engendering a team culture in testing IT solutions. The new Directorate will approve the company’s “road map” on digitalisation, assess opportunities for synergies across the most viable projects, and will be involved in accelerating corporate change and developing digital competencies throughout the business. 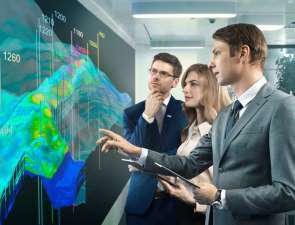 Gazprom Neft’s plans include developing its own IT platforms for creating new information flows and datasets, and developing predictive analysis tools, with the requirements and architecture for a prototype platform already being worked out. Gazprom Neft plans also to begin developing new products and services based around the implementation of cutting-edge digital technologies. Gazprom Neft has already implemented a range of successful projects over the past two years, including implementing blockchain technologies, AI systems, “Big Data” predictive analysis systems, and the “Industrial Internet of Things”. The creation of “digital twins” for wells, drilling sites and refining facilities has also proved highly effective. The Digital Transformation Directorate will be responsible for collating information and data on the company’s projects and its experience in implementing cutting-edge technologies, and will determine strategies for their further development.